We set up Montessori spaces for our son from birth. He has also been given a lot of freedom of movement from birth and the result has been very good gross motor skills, body awareness, confidence and independence. He is very aware of his capabilities and doesn’t take uncalculated risks. I really believe these have been largely due to the environment. I have shown his spaces during the symbiotic period. Those spaces were temporary. Because we were not in our home for the first 7 weeks of his life, we created small but temporary spaces to meet his needs. Once home, he spent most of his time in his room, and because it was prepared for him, he had freedom to move. I just observed and made simple modifications to the room when needed but never really got in his way or tried to help him and he figured it out. So let me show you his room! 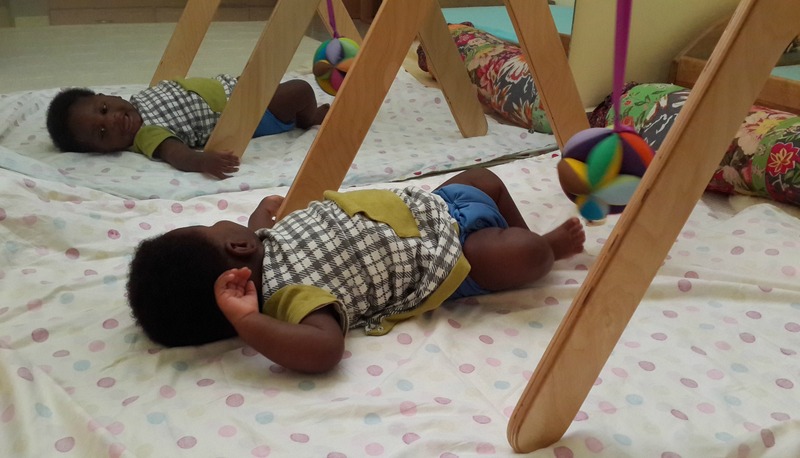 Welcome to our Montessori Infant room. 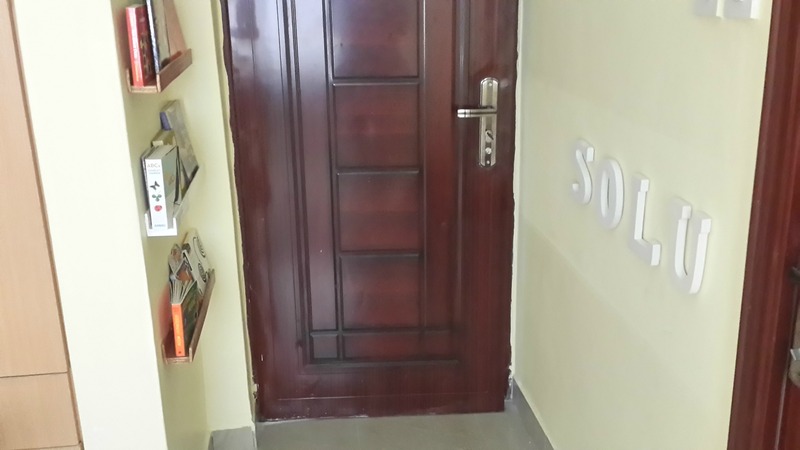 I wanted to put a book shelf in the room but didnt want to take up space so I used this wall space behind the door. He is now able to reach the lowest shelf at 10 months. 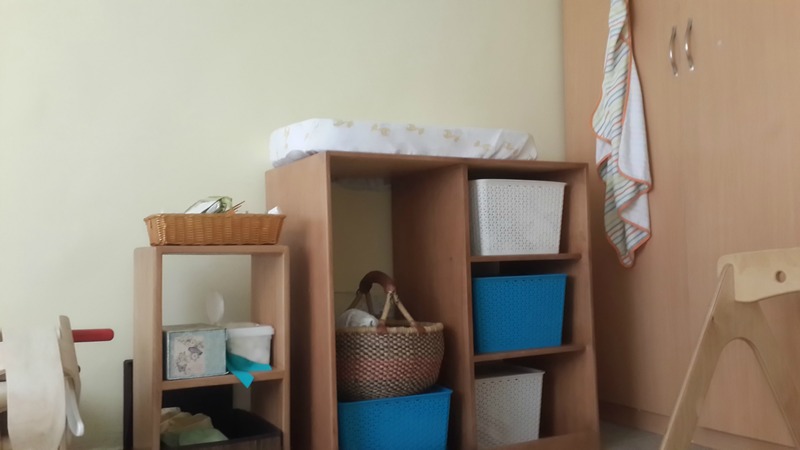 There are usually four areas considered in a Montessori Infant room. They are Sleeping, Feeding, Movement and Physical Care. We chose to not include the feeding area in his room as we did not want any adult furniture in the space It’s not a large room and I just felt a nursing chair would take up too much space so we had the 3 areas. We also did not want to introduce ants or roaches so no food was allowed in the room. The first picture is the view from our room which is across the wall. He quickly figured this out and before 6 months. He would play in his room and then slither on over when he was done. The sleeping area: This area just consists of a floor bed. He napped on the floor bed and started out the night on it. He slept in our bed for the rest of the night. In our training, a mattress on the floor is what is recommended but my husband felt he should have a bed since we sleep in a bed and I’m so glad we reached that compromise. 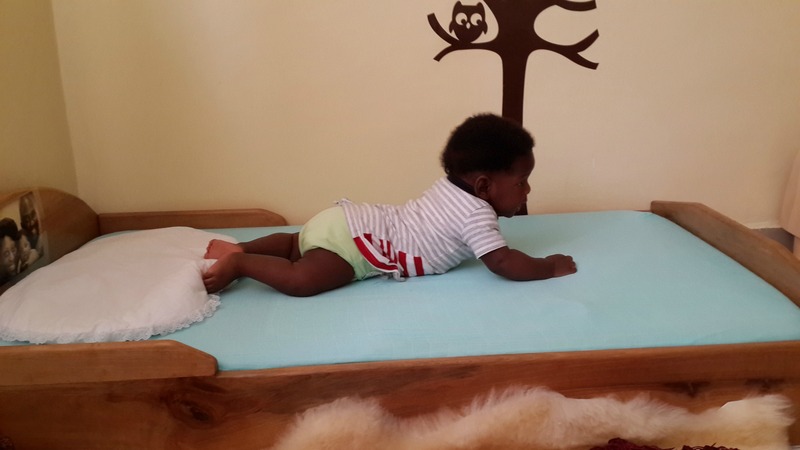 You can see him in the video below at 5 months trying to figure out how to climb unto the bed. They were a few times when he bumped the wood but it was nothing a little hug and kiss did not solve and when that happened, you could see the change to his method the next time he tried. I cannot recommend the floor bed enough. It has been a big key to his independence. Although he climbs into his bed to chill or play, he has not yet climbed into it to go to sleep but when he wakes up, he sometimes just stays and plays or he comes to find us. We have found it to be really safe and never have to worry about him falling or jumping out of bed. We also didn’t have to watch the monitor once he started crawling because he could come to us when he needed us. Happy with himself after rotating 180 degrees. Not a small feat for a 3 month old. Trying to climb his bed at 5 months old. The movement area: I have discusssed the movement area in this post. This was his movement area. This large mirror was amazing. Once he started slithering at 5 months, I would leave him at the edge of his rug, go into our room acrross the hall and I could watch him in the mirror. He could also see me and knew to head back in my direction when he was done. When preparing this room, we thought about the changes that would be needed after the first year. Instead of an armoire or traditional changing table, we had this shelf built. 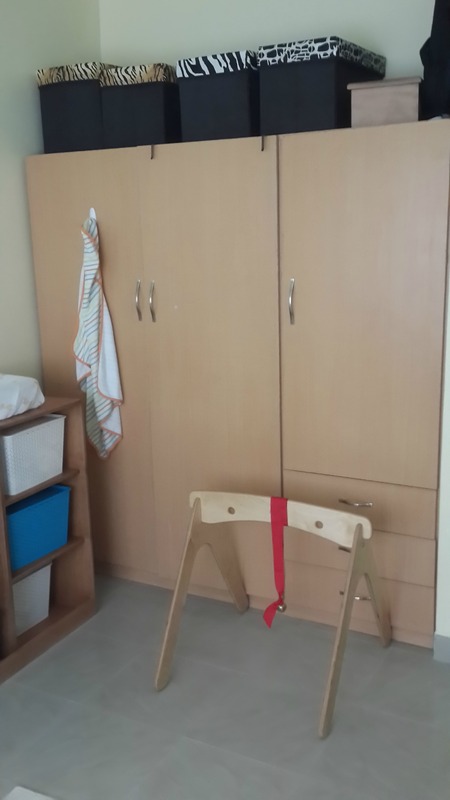 We plan to add a pole for hangers once he is comfortably walking so that we can hang a few choices of clothes for him daily and he can choose what he wants to wear. the cubbies on the right will hold his basics i.e. pants, vests, socks etc. They will all be accessible to him. For now, the blue and white baskets hold his clothes the brown basket holds his diapers, blankets etc. the things I need to dress his up (comb, lotion etc.) were in the small basket to the left. 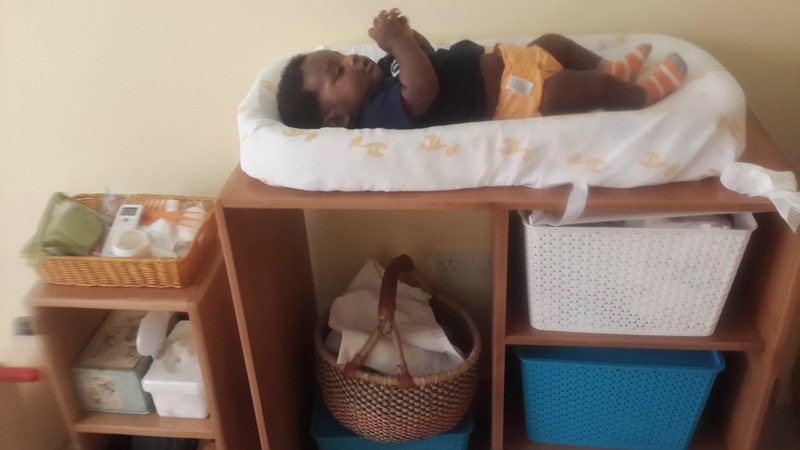 His changing area until about 7 months when it became really hard for him to stay still. Some people hang mobiles above this area but my training suggested that these times of providing physical care were a good time to connect and form relationships, as well as collaborate with the child. So I didn’t hang one and I have to say I think it was best because we would talk to him, point out his body parts, ask him to put in his hands and lay other foundations for collaboration. Now at 10 months, he actually responds and can point out several body parts and put in his hands, legs or head when asked to. I would have loved to have a picture on the wall but we had issues with the paint and decided not to. We also have a closet where I store his other clothes, supplies and toys. Before having him, I organized his things in bins by month. This has made it easier to find things when they were needed. closet and storage. You can also see the mobile hanger we used since our ceiling was not able to hold the hooks we tried. That’s it! We wanted a simple, orderly, beautiful, easy-to-keep-clean room. The things we considered are the colors of the wall, curtains, carpet, ceiling and furniture. We wanted a calm but pleasant feel in the room and I think we achieved that. The floors and carpet are easy to clean, as are the curtains. He can see the whole room from any point. As soon as you walk in, you know it’s his room. He knows it too. It was quite simple to put this room together but I truly believe the time he spent here in his first six months, laid the foundation for his confidence in movement. He knows his abilities and is very aware of his body. You can literally see him calculating and trying to figure out whether he is able to walk or stretch to reach a specific distance and if he can he does and if not, he gets down and crawls or makes adjustments needed to reach without hurting himself. The one thing I wish we had more of is pictures/art. You can see the frames beside the shelf but our walls/paint did not cooperate. We also started the mural by his bed but had to stop for the same reason. We have recently found a solution, so with the next set of changes we make to his space, we’ll add some. I cannot stress how important the prepared environment has been for us. We have really seen the benefits of an environment that supports the child. I’ll write another post detailing the changes we made once he became very mobile and the changes I am making now that he’s walking. This post was written for my friend who just had a baby.Congrats lady! 🙂 Welcome to the world little guy! I can’t wait to meet you. 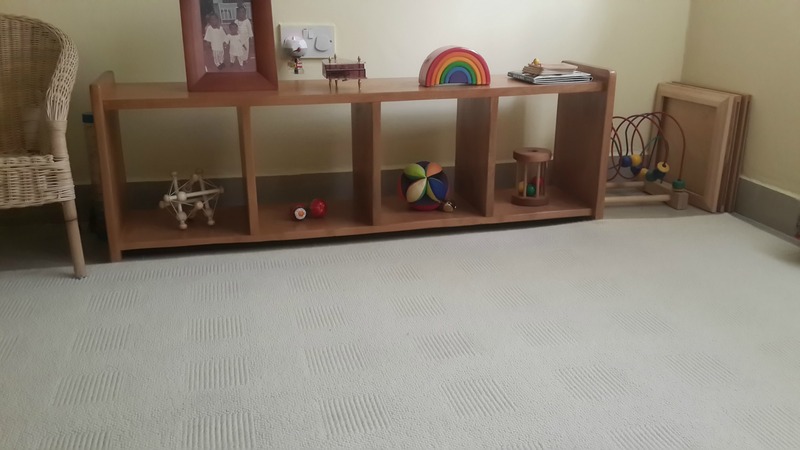 Perfect Montessori room! Everything is so esthetic, order, beautiful and clean. Thank you so much makelifemontessori. Lovely post.very interesting to read got a lot from this post. Will implement what I learn once baby n I are back. No kids yet, some day I hope! This is awesome as an adult I love space and easy access to all the things I use especially the ones I use daily. I’m glad to learn that that is both an innate need for children that should be encouraged. My deduction is that creating such environments like all aspects of parenting has to be a conscious and deliberate effort parents believe is important for the child’s well being. Thanks for sharing that this is possible and rewarding! Yes it is definitely a conscious effort and one that requires some education and knowledge. I am thankful to have encountered this knowledge and hope to bring it to others. It really does make a difference especially when encountered before having children. You are lucky! I am amazed each time I watch your videos and read your blog, it inspires me and makes me believe much more in the Montessori method… it truly is the way of life!! Welldone, I look forward to reading more! This environment is so beautiful and engaging. Thank you for sharing your home with us. I prepared an almost similar environment for my twin sons before I had them but they were born prematurely and it was suggested by their medical team for them to cosleep with us for the their first few months of life…something to do with them being at a high risk for SIDS. They have been napping in their room but I’m now starting to transition them into their room for night rest too; they are 4.5 months old now. I wonder and worry if they’ll adjust to their new environment. They will share a room but have separate beds; I am eager to observe how they will engage with their environment. What’s your take on this? Hello Faith. Thank you for your comment and the compliment. I think this is probably the best time to transition them. The longer you wait the harder it becomes. I’m sure they will adjust especially since they already nap there. That said, observation is the way we decide how to proceed as you already know. So observe and then go from there. Do let me know how it goes. Thank you for your lovely blog including images with your writing helps me visualize the concepts your discuss so much better. 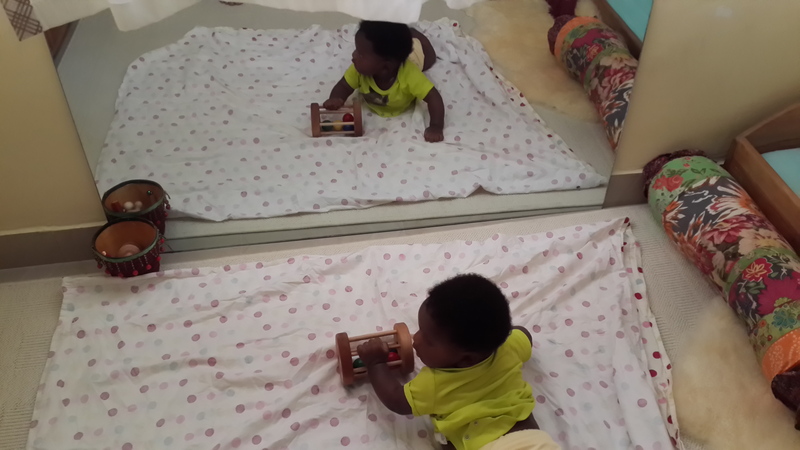 I am a new grammy and helping my daughter set up her nursery and home in a montessori way. I discovered your lovely blog a couple weeks ago and have been methodically reading through looking for inspiration as well as resources. I am especially interested in Solu’s mobile hanger if you could share the resource it would be wonderful. I would love to acquire something of this sort for my daughter’s very small apartment. Thank you for your comment Alice. I am a very visual person and love to see pictures so I’m glad people appreciate what I sometimes think is picture overload. Solu’s hanger is from an etsy shop. I will look it up and post the link. It was on the expensive side but I chose it because it was easy to disassemble and travel with. I will try to put together a list of options this weekend. Sorry it took me a while to respond.